This is going to be a FUN one for sure!! Come out and join us for our May installment of our FREE 5k Fun Run Series on Sunday May 15, 2016. 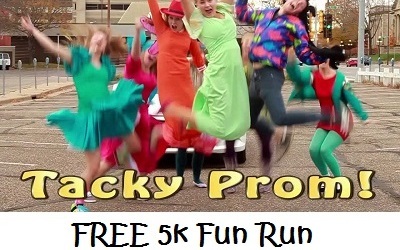 We are having the “Tacky Prom Free 5k”! So go raid your parents’ closets, your grandparents’ closets, your local thrift stores and find the wackiest, tackiest, frilliest prom attire out there! Once again, this is a FREE event for participants, but we are asking that everyone bring a donation for a local cause. May is Melanoma Awareness Month, so we are asking for donations of sunscreen to be distributed to the local watermen in our area. These workers are out in the elements 7 days a week, and many have fallen victim to melanoma over the years. This is our small way of giving back to the community that keeps our seafood industry alive. On-site registration will begin at 7:30am at the store, and the run will begin at 9:00am at the entrance to the Marea Terrace development. Please plan to arrive to the store no later than 8:30am to complete your registration, and we will go over to the start line together at 8:45am. Online pre-registration is open and can be found HERE! The race WINNER will be determined by who guesses their finish time by the closest margin – anyone within 10 seconds of their actual time will be a WINNER! And, we can’t have a ‘tacky prom’ race without an actual PROM, so please plan to join us after the race at Eastern Shore Brewing for the TACKY PROM party!! $1 off drafts, music, dancing, and FUN!